The SPJ national board held an electronic meeting on June 14 to discuss a proposal to change SPJ’s governance structure. The board unanimously approved suggested changes to SPJ’s bylaws to carry out this change. Below is a summary of the major ones, with my thoughts on them. I agree with almost everything proposed, but strongly disagree with one idea. If you want to explore the plan further, go to https://www.spj.org/governance.asp. Regional directors would still exist in the new structure, renamed “regional coordinators.” They still would be elected within their respective regions. In May 2016, I spoke out in favor of the idea of shrinking the national board. I suggested 17 members. I recommended removing regional directors from the board and eliminating representation by region and by type of constituency (campus chapters, students, pros). I pitched the idea of adding board slots for liaisons from other journalism organizations representing specific groups, but I don’t think there’s much support for that. I’m very much in favor of contraction. Nine is a reasonable number. If we were starting a board from scratch, we wouldn’t have 23 seats. I fully support the change in duties of regional directors/coordinators. Currently, they serve two roles (1. counsel for chapters, 2. board members) at the same time. It’s tough do both well. There is no need for regional representation on the SPJ board. No issue ever has required, for example, an East Coast or West Coast perspective. Different people holding the same regional director position might have totally different ideas. Some might wonder about cutting the campus chapter representative positions. To be clear: The board still wants campus representation. Under the proposed plan, if no students or faculty members are elected, at least one will be appointed to the board. An earlier draft of the proposed bylaws included term limits, but the board voted 15-7 against it. I voted no with the rest of the majority. The controversial idea that I strongly oppose is in the nominations process. It is not part of the bylaws, but is in a supporting memo recommending a process. The nominations committee would have seven SPJ members: immediate past president, an elected board member, a regional coordinator, a student, and three others who are part of SPJ committees, communities or chapters. The committee would check that candidates are eligible for the positions they seek to hold, such as whether they are members in good standing and can attend meetings. An SPJ president must have a) served on the SPJ or SDX board, b) chaired a national committee, or c) been a pro chapter president who is or was on a national committee. The nominating committee would interview candidates and, based on these subjective traits, recommend candidates — giving what I call a “Good Housekeeping Seal of Approval.” Those recommended candidates would be denoted by a symbol on the ballot. I am against this approach, which I think injects an unfair weighting to an open election. The argument in favor of having recommendations is that the nominations committee is entrusted with putting forward the best people to be board members. I see nothing wrong with trusting the electorate to determine that. Candidates’ credentials should speak for themselves. I balk at an extra thumb on the scale to tilt an election toward any particular people. In my mind, it turns an election into a ratification and discourages voters from thinking for themselves. I will speak against this part of the proposal at EIJ17. This is a much less important point, but I also oppose the thinking expressed in an organization chart recommended for the new board. It shows each of the four new at-large elected directors overseeing one constituency — students/educators for one, communities for another, members at large for a third, regional coordinators for a fourth. To me, that directs SPJ members to only contact an assigned liaison on the board or a staff member. I think everyone elected to the board represents every SPJ member. We should make it clear that any SPJer may contact anyone on the board, for any reason. This is only tangentially related to the governance proposal, but I want SPJ to do more to let members learn about candidates. Candidates introduce themselves in Quill and their bios are posted at SPJ’s election page. They may speak for a few minutes at a business meeting at EIJ. This doesn’t do enough to tease out issues, platforms, and positions, like we expect in the elections we cover in our day jobs. Why not also have a candidate forum? It could be during the convention or as an electronic session beforehand, streamed live and archived. A moderator would ask questions of candidates, maybe even in a debate style. There could be Twitter chats. As we choose our leaders, the more info, the better. To see the proposed bylaws and supporting memos (organization chart, board position description, board appointments, nominations process, reimbursement guidelines), go to https://www.spj.org/governance.asp. If you will be a delegate at this year’s national convention, you’re better off looking through the various documents beforehand. There’s a lot to this plan, and it will come before the delegates for one or more votes. Congratulations to all of the Mark of Excellence winners and finalists from 14 schools in Region 2. Here are the results. INDIANAPOLIS — The Society of Professional Journalists recognizes the best collegiate journalism in Region 2 with 2016 Mark of Excellence Awards winners. SPJ’s Region 2 comprises Delaware, District of Columbia, Maryland, North Carolina and Virginia. Honorees received award certificates on April 8 at the Region 2 conference. First-place winners from all 12 SPJ regions will compete at the national level. National winners will be notified in the late spring and will be recognized at the Excellence in Journalism conference in Anaheim, California. The list below details all Region 2 winners. If you have any questions regarding the MOE Awards, contact Abbi Martzall at amartzall@hq.spj.org or 317-920-4791. This is a long way away from Region 2, but it’s worth sharing. Did you know there is a group of SPJ members inside a prison? San Quentin State Prison in Northern California. to become members of the Society of Professional Journalists. and the craft of journalism with guests who are both news-makers and journalists. 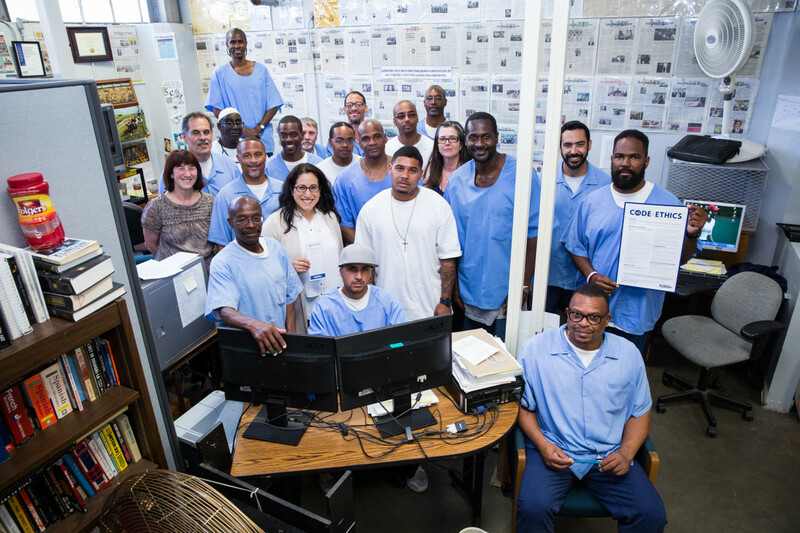 Check out the copy of the (new) SPJ Code of Ethics in the group photo and read the inmates’ accounts of what journalism and SPJ mean to them. There’s a lot to think about here. The SPJ national board agreed on Tuesday (Nov. 18) to spend some money – $32,000 to improve the society’s technology systems. As a memo on the project described, SPJ’s technology has three parts – an in-house database (called iMIS), a hosting provider and a website. The database and the website were launched at around the same time in the mid-1990s and were not integrated. One specific example is registrations for SPJ’s national conference, which have to be entered manually. The project that the national board approved will create “one cohesive platform for almost everything we do,” the memo says. This will lead to enhanced features on the website and more efficient, improved use of the database (this is boiling down the explanation greatly). The project will happen in three parts. The first part will take four to six weeks. The second part will take six to nine weeks. If all goes according to plan, the improved member website will be available in late 2015. This was the second time the national board has met by Skype. The meeting lasted about 13 minutes. Sixteen of the 23 members of the national board participated in the call. The vote in favor of the project and expenditure was 13-0. Those voting in favor were: me, Paul Fletcher, Lynn Walsh, Sue Kopen Katcef, Bill McCloskey, Alex Tarquinio, Jordan Gass-Poore’, Brett Hall, Becky Tallent, Michael Koretzky, Joseph Radske, Rob McLean, and Tom Johnson. Mike Reilley and Patricia Gallagher Newberry were on the call, but didn’t vote. As president, Dana Neuts also didn’t vote. The president typically votes only to break a tie. Ethics code highlights: So, what changed? Maybe the updated SPJ Ethics Code is no longer a front-burner issue six weeks after it was approved (Sept. 6, by a voice vote). But I think it’s still worth highlighting what was changed. My past posts showing proposed changes to the code, draft by draft, line by line, and my thoughts on them, might have been too busy and overwhelming for the average person. For example, this. Some people followed along intently with as much wonkiness as I had, but at this year’s convention in Nashville, more people wanted something more boiled down and digestible. • The preamble was reworked, but the different wording doesn’t have any substantially different ideas. • In a few places, “journalists” has been replaced by “journalism.” Presumably, the idea is to include anyone who practices journalism — which is more important than trying to define journalists. • Examples deleted: “Avoid stereotyping. Journalists should examine the ways their values and experiences may shape their reporting.” The code used to say “Avoid stereotyping by race, gender, age, religion, ethnicity, geography, sexual orientation, disability, physical appearance or social status.” The argument for the cut was: Why the need for examples? And what if something is left out? I think the examples spark an inner review that can be illuminating. Prompts help us see stereotyping we didn’t realize we were doing. • A watering down: The old code said: “Distinguish between advocacy and news reporting. Analysis and commentary should be labeled and not misrepresent fact or content.” The new code says: “Label advocacy and commentary.” The new, weaker language is hazier and less meaningful. • An even smarter addition: “Consider the long-term implications of the extended reach and permanence of publication. Provide updated and more complete information as appropriate.” Many newspapers print lists of arrests, and don’t have initiative, time or staff to follow up on adjudications. In the age of the Internet search engine, this presents a huge ethical problem. • An excellent, more forceful rewording: Old – “avoid bidding for news.” New – “do not pay for access to news.” TV networks run roughshod over ethics by paying sources, then rationalizing it as “licensing fees” – which, coincidentally, always come with exclusive interviews. Under the old wording, this was acceptable, as long there was no competitor trying to pay that same source. • Stronger language on corrections: From “Admit mistakes and correct them promptly” to “Acknowledge mistakes and correct them promptly and prominently. Explain corrections and clarifications carefully and clearly.” A cryptic correction buried in the back of the paper isn’t enough. • Linking: It’s something I hadn’t thought about until I read Buttry’s convincing argument. He writes: “It’s the best way to attribute in digital content. It provides depth and context. A culture of linking is a strong measure to help prevent plagiarism and fabrication.” In Nashville, the arguments against linking were peculiar. One journalist talked about working in a dangerous setting, where she could be punished for showing where she got information. Others balked at forcing journalists to link. Actually, no one would be forced to do anything – the code is almost entirely “Journalists should…” Add “whenever possible or practical,” if tempering it makes you more comfortable. • Suicide coverage. The Ethics Committee proposed: “Be cautious about reporting suicides that do not involve a public person or a public place.” I spoke out strongly against this reference when I read it. First, it singles out suicide, rather than calling for care in reporting on any death. Second, the subtext is that suicide remains a taboo topic to be avoided whenever possible. This is an outdated way of thinking, perpetuating the myth of stigma attached to suicide. Actually, suicide is a serious mental health problem that should be covered as much as possible, remaining sensitive while covering a person’s life and death. Finally, there was an unintended meaning as it was written: Private suicides require caution, but public suicides do not. The SPJ national board agreed it should be removed. After further objections in Nashville, it was cut before the code reached delegates for a final vote. • Anonymous online comments: This is a particular peeve of mine, and I figured that, as part of the code update, it was worth trying to get SPJ to be a leader in ethical thinking. Anonymous online comments too often are corrosive and harmful to an atmosphere of thoughtful, civil debate. They turn the ethics of responsible comment (letters to the editor are edited in advance for libel; identities are almost always required and confirmed) on their head. So, I proposed adding: “Encourage a civil exchange of public opinions. Recognize the potential harm of allowing anonymous online comments.” There was some support within the national board and even more in Nashville, but unresolvable dissent on what to target and how to say it. I didn’t pursue the matter further before convention delegates, which might have prolonged debate. Maybe I’ll try again in the future. Epilogue: It was particularly interesting to look back on the start and end of the code update process. A year ago (and even before that), some people clamored that the code – last updated in 1996 – was woefully out of date, largely because it didn’t address the new phenomenon of social media. I was skeptical at the time about the need for any update, but especially one based on that reasoning. I thought the code’s principles of ethical decision-making work fine on any platform. Information’s distribution channels didn’t matter; the ethics that went into gathering, compiling and presenting the information did. Still, the code update process moved ahead. But, go figure. There’s one more thing missing from the new code: Any reference to social media.